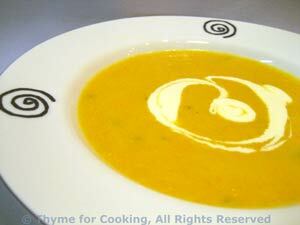 Carrot Soup with Sherry, Ginger, Thyme for Cooking gourmet soups. A velvety soup with just hint of spice from the ginger! Add more if you like.... The sherry cuts the carrot's sweetness just enough, and the potato adds a bit more substance. Add more or less chicken stock according to preference. Mince ginger if using fresh. Thinly slice carrot and potato. Heat butter in medium saucepan. Add onion, ginger and sauté until tender and transparent, about 5 minutes. Add carrot, potato, stock and sage. Bring to a boil, cover, reduce heat and simmer until vegetables are done, about 20 minutes. Purée in blender or use an immersion blender. Add sherry, milk and nutmeg and gently reheat. Do not boil. Ladle into soup plates and serve, with a dollop of Greek Yogurt on top and some freshly ground pepper.